America is awash in polarization and contempt. Tribal politics appears ascendant, while civility and amicable disagreement are routinely cast aside on social media, in the news, and in public life. 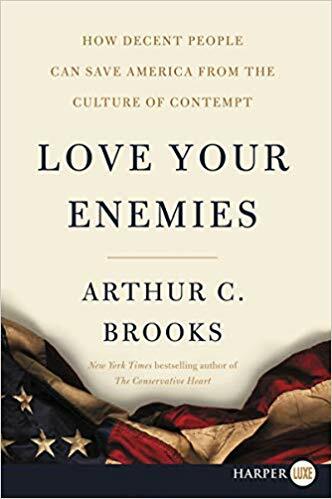 In Love Your Enemies: How Decent People Can Save America from the Culture of Contempt Arthur Brooks, the CEO of the American Enterprise Institute, takes on the contempt and division that are tearing America apart. And he makes a compelling argument for how readers can fight back, restore a productive competition of ideas, and unite the country. Grounded in empirical research, ancient philosophy, and lessons from history’s greatest leaders, it demonstrates why a backlash against tribalism and contempt is not only possible, but probable—if properly encouraged. Love Your Enemies is no Pollyannaish account of our political moment, nor is it simply wishful thinking. It is a social scientist’s analysis of the powers of polarization and divisive leadership, that asserts that while they may be strong, they aren’t lasting. The evidence is clear that we can’t sustain, nor do we truly desire, a world in which we’re constantly in conflict with our fellow citizens. Americans, no matter their political persuasion, can unite to put an end to ideological holy wars. All of us have a stake in America’s civil discourse and Love Your Enemies is both catalyst and guide for a movement to take the country back from the extremes. Arthur Brooks is setting out to show that this movement, ultimately can, and will, be victorious. Arthur Brooks offers the practical prescription in Love Your Enemies that could lead to a more peaceful, just, sustainable, and healthier world. Love Your Enemies is a handbook for a new generation of leaders who want to bring America together—and anyone seeking to be more effective in a fractious political environment.